It is important to keep in mind that there is always room to improve efficiency no matter how high the uptick is going but 'how' is the question. It all starts with the first of the 4 Pillars - capture. In order to understand how to increase business efficiency and create a standard way of working in your organisation, you're going to need to capture your current way of working, understand where it needs to change and implement improvements. By , you'll see how 8 organisations managed to capture, share, use and improve their processes and succeeded in saving time and money while greatly increasing business efficiency. The first step in the Continual Improvement process is to capture your processes through process mapping, find the wasteful or broken processes and work backwards from there. It seems simple, but you will need an easy to understand process mapping methodology that can capture your full end to end processes and a user friendly process mapping tool that can show cost, effort and time data. The Continual Improvement methodology and tools need to be user friendly because any process captured will need to be a process shared with anyone who is involved with carrying out that process. As there can be thousands of processes in an organisation with every employee responsible for different ones daily, it is essential that you can access a 'Process Library' that sits at the heart of the organisation with easy access granted to all. Once access has been given, employees need to actually buy-in to the management system and use it. Placing the system at the heart of your organisation exhibits a serious intent for change but there is more; the tools and methodology must be clear and easy for staff to follow - getting people on board is hard enough as it is. New systems/projects must be promoted to staff in fliers, stationary, posters, billboards, emails and events. Follow up events need to be held every 6 months to really ensure that your Continual Improvement approach has taken root and for the team to understand that this is the new direction. Process optimisation modelling is essential for the improvement of any process. Capturing existing processes is the foundation of any change; to capture is to understand. The Improvement part comes when you are able to analyse the current process, find the bottlenecks or process breakdowns and model potential solutions before actually implementing real change. Once you have utilised these 4 pillars of Continual Improvement, start again! Continual Improvement means the job is never done. Trying to attain perfection is impossible, but the Continual Improvement process provides improvement in small increments adding up over time to gigantic leaps in efficiency - this is the closest you will ever get to perfection. 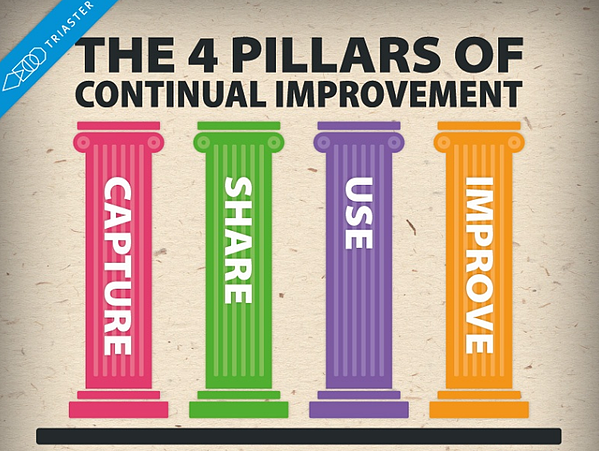 So why are these 4 Continual Improvement process elements displayed as pillars? Because each pillar is as important as any other to hold up the continual improvement process initiative - without one, the rest are useless. Below, I have included an Infographic of Triaster's own approach to the 4 Pillars so you can see how a Business Process Management Software Company can help facilitate the big 4. The problem with Continual Improvement process principles is that it's all theory. Unless there is a real experience, with a real person and practical application that you can track from A-B, then it's mostly just going to stay as a good principle on a blog article.